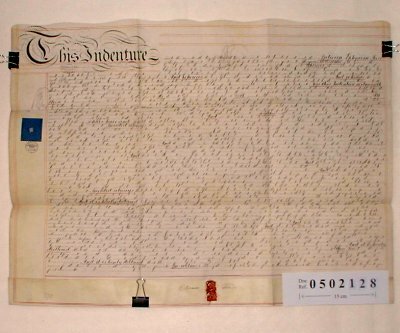 The document begins by reciting that Thomas Price of Walford died intestate in 1850 leaving Ephraim Price as his only son and heir at law. Ephraim Price is now borrowing £120 from Thomas Williams on a mortgage on property in Walford that he inherited from his father. The property consists of 2 cottages with arable land totalling 3 acres on either side of a road leading from Walford Mill to Bishops Wood Lime Kiln. The land is at The Leys and was formerly part of Bishops Wood Common.